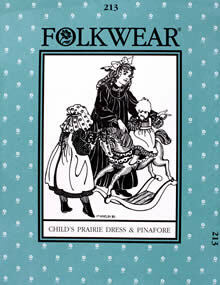 This dress is just like big sister # 201 Prairie Dress, but with a sweet pinafore that fits over the dress instead of an apron. 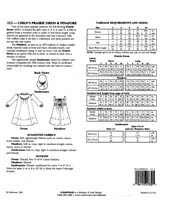 The dress yoke and pinafore front are perfect for tucked, embroidered, smocked, or beaded embellishment. Also included is a period sunbonnet to protect tender faces. Girls 2-10.